With bold pied plumage and a long crest, the tufted duck is a distinctive diving duck and a member of the Anatidae bird family with other ducks, geese, and swans. Tufted ducks can be hard to identify properly in many areas, however, because of extensive hybridization with similar diving ducks. The long tuft of feathers from the crown of the large head is a distinct field mark to watch for, as is the bright yellow eye that helps this bird stand out. Birders who learn more details about this Eurasian duck will be able to recognize and identify it easily, and this fact sheet has everything you need to feel confident about the tufted duck. Male tufted ducks are glossy black allover except for contrasting, sharply-edged white flanks and white abdomen, and the back can appear more gray than black in bright light. The head and neck may show a faint purple or green iridescence in the brightest sunlight. Females are dark brown-gray overall with a bold rusty wash or blurred barring on the flanks, and the undertail coverts are whitish with gray streaking. Females have much shorter crests than males, and may show a very small white patch at the base of the bill, though this is not always noticeable. The back is generally darker than the underparts. On both genders, the eyes are bright golden yellow, the broad bill is blue-gray with a black nail and tip, and the legs and webbed feet are gray-black. These ducks are generally quiet, but they do have growling calls, low croaking quacks and low whistles as part of their vocal repertoire. These ducks are often confused with ring-necked ducks, as well as lesser scaups and greater scaups. While all three of these species have similar plumage coloration and markings, the long head tuft is only seen on tufted ducks and is the key to identifying them correctly. These diving ducks prefer deeper bodies of water such as lakes, slow-moving rivers, and both natural and artificial reservoirs. They may also be found in city parks where suitable ponds or lakes are present. Tufted ducks prefer freshwater habitats, but are found more widely in coastal bays, estuaries, or deeper brackish marshes in winter. These ducks are found year-round in western Europe, including the United Kingdom. In summer, their breeding range extends to Iceland, Scandinavia, and throughout Russia. In winter, they migrate to southern Europe and northern Africa, including the Nile River valley. To the east, their winter range stretches from the Middle East through India to eastern China and Japan. They are particularly abundant along coastal Italy, the Caspian Sea, and similar habitats. While these ducks are not commonly seen in much of North America, limited numbers do reach western Alaska each year. Vagrant sightings may be recorded along both Pacific and Atlantic northern coastlines, especially in winter, and rare sightings are even noted in the Great Lakes region. These ducks are partial migrants. 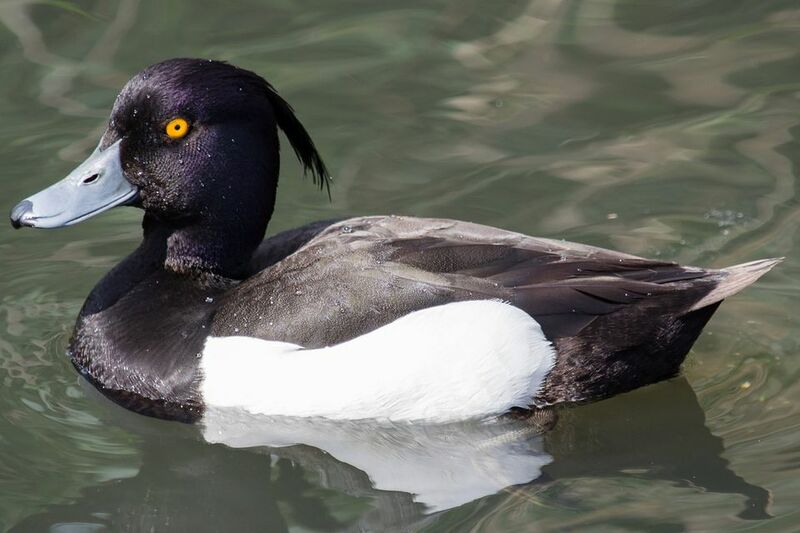 A central core of their range in western Europe is occupied year-round, though tufted ducks do spread out further north and east during the summer breeding season, as well as further south during the winter months. Tufted ducks are superb divers, going as deep as 50 feet below the water's surface as they forage. They can be quite gregarious after the breeding season, and gather in very large flocks that may be mixed with other diving ducks, particularly scaups and ring-necked ducks. When startled, they will take off from the water quickly, running briefly along the surface to get enough speed for an explosive liftoff. Like most ducks, tufted ducks are omnivorous and eat a wide variety of foods. They dive below the water's surface to seek out aquatic plants, amphibians, crustaceans, seeds, mollusks, grain, and aquatic insects. The exact foods that make up their diet will depend on the water quality of their habitat as well as which foods are most abundant in different seasons. Tufted ducks are monogamous and engage in brief courtship displays that include head bobbing and synchronized bill dipping. The female builds a shallow scrape or low platform nest of grasses, lining it with down. The nest is usually positioned under a bush or dense grass for camouflage. These ducks regularly hybridize with similar species, including greater scaups, lesser scaups, and ring-necked ducks. Less frequent hybridization has also been recorded with common pochards and mallards. The eggs are oval-shaped and range from light yellow to pale brown or greenish, and there are 7-12 eggs in each brood. The female incubates the eggs for 25-29 days. After the chicks hatch, they can leave the nest quickly and will begin diving to forage within 48 hours. Both parents guide and protect the ducklings, which will take their first flight at 50-55 days old. Juvenile tufted ducks stay with their parents for up to 110 days as they mature. These ducks are widespread and numerous. In some areas their range is expanding because of sand and gravel quarries that create additional reservoirs that serve as ideal habitat. These ducks are susceptible to oil and other chemical pollution, however, and they can be dramatically impacted by avian influenza. In some countries, most notably Denmark, Italy, and Iran, tufted ducks are managed as a game species for regulated hunting. While these ducks are not a backyard species, they can be attracted to appropriate habitats that have a rich aquatic ecosystem for adequate feeding. Preserving that habitat is essential for attracting these ducks. Controlling agricultural runoff and managing invasive plants are critical steps to keep appropriate habitat healthy and thriving for tufted ducks. Supporting waterfowl conservation groups, such as Ducks Unlimited, is also helpful to protect these and other ducks. Tufted ducks are easy enough to find when birders visit the proper habitat in the birds' range. They are more easily spotted during migration periods when duck flocks are larger, but could be noticed at any time of year. Deeper bodies of water with healthy ecosystems are most likely to support tufted ducks, though they will occasionally be found in urban or suburban parks as well, particularly in winter when other bodies of water may be frozen and food is scarce. Don't forget to check out all our other amazing bird profiles!